1. 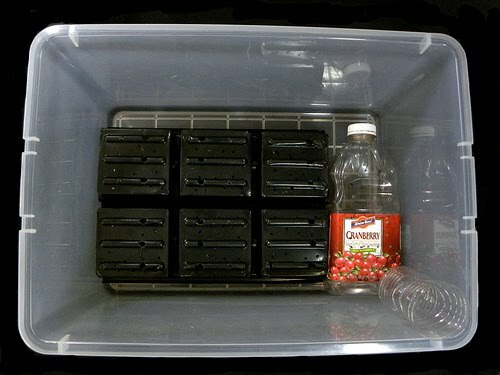 Go to a discount store (eg Dollar Tree) and buy a plastic colander with an approximate 10 1/4" diameter (10 1/4" is the width at the bottom of a typical 5-gallon bucket) for about $1.00US. Cut the protruding handles (if any) off the colander. 2. Watering Pipe. To get water into the reservoir use a 1" PVC pipe, 24" in length. With a 1 3/8" hole saw or another cutting tool, drill or cut off 3 or 4 of the plastic strips in the top or near the top of the colander. The watering pipe will go into this hole down into the reservoir. Cut a notch in the end of the 1" PVC pipe so water will easily flow into the reservoir. 3. Firmly push the colander (upside down, like an upside down bowl, so it forms a dome) into the 5-gallon bucket until it reaches the bottom. If it's a tight squeeze, you can cut small inverted V shaped notches in the colander's rim so it can flex and fit better. 4. Wa ter Overflow / Air Holes. You'll have to create a water overflow/air "tunnel" from inside the colander out through the potting mix and out through a hole on the side of the bucket. Drill a 3/4" hole in the side of the colander about 1/2" to 1" below the top of the colander (see picture with water dyed blue). Next drill a 3/4" hole on the side of the bucket at a height so the poly pipe will be horizontal. Stick a piece of 1/2" poly irrigation pipe (you could alternatively use a McDonalds or similar drinking straw with smaller holes) through the hole on the bucket's wall and into the colander's dome. There should be about a 1/2" to 1" of air space in the dome above the drainage/air pipe. This will provide a layer of 1/2" to 1" of air for the plant's roots. The pipe will serve as the overflow drain and air path. You want to get air in, and excess water out. You may want to repeat this step with a pipe and hole on the other side of the bucket, as seen in the picture, so you'll have a backup air/water overflow hole in case the primary pipe clogs or fails. Y ou're done! 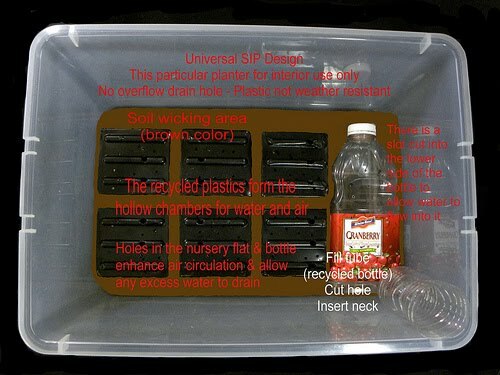 Just fill with potting mix and plant as described in our videos. As you fill the bucket up with potting mix, firmly pack down the potting mix (like in our planting video) surrounding the colander so water will wick well. Advantages/Disadvantages/Thoughts: Cheap, about $4.00 to $5.00 US. Only one bucket is used and your time spent drilling holes is reduced by 75%. Like the traditional Global Bucket, it does take a lot of time gathering the materials and setting up, but there should be a time saving over the traditional Global Bucket. This colander system will have a smaller air surface for aeration that the traditional Global Bucket. If there is too much wicking (ie soggy soil) for your plants, you can drill a hole(s) in the side of the bucket below your existing poly pipe hole. This should lower the height of the water level and thus a reduction in the wicking area, but your reservoir will be reduced. Automatic Watering (like in our irrigation videos): Run the 1/4" tube down the fill tube into the reservoir. The following was designed by Bob Hyland at his wonderful website Inside Urban Green. 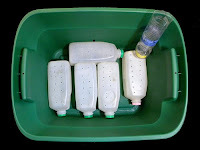 Required Tools: All you need is a hot tool to poke holes in the plastic containers (milk jugs, juice bottles, nursery flats, etc) and a hot knife to cut a slot in the bottom side of the bottle(s) to allow free flow of water. There is no need for power tools, PVC tubing and complicated fabrication. For larger images, click on the pictures. 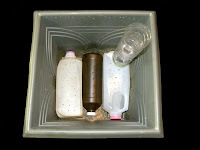 Recycled plastics (food containers, nursery flats) create the soil platform, soil wicks and water reservoir. 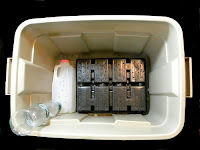 Five milk containers are used here (about 2 1/2 gallon reservoir capacity). 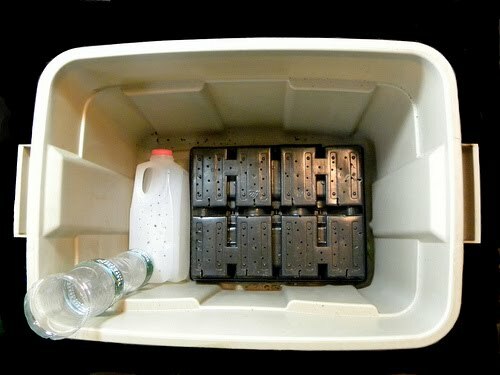 Cut large slots on the bottom side of the containers to allow water entry and poke holes in the top side for aeration and drainage of any excess water. 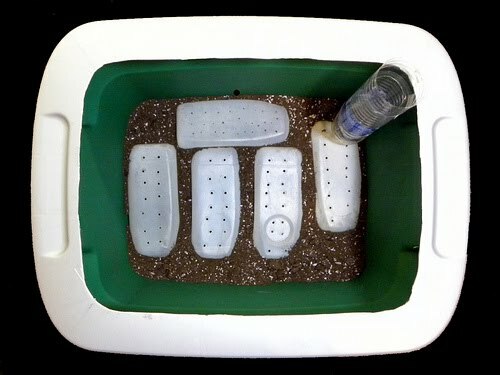 An overflow drain hole (top center) prevents over watering. Recycled water bottles create a fill tube. Potting mix (NO top soil) packed down between th e recycled plastics creates the soil wicking system. The water from the reservoirs will rise by capillary action creating a uniform distribution of water throughout the bucket. Simply pour water down the fill tube until you see some water exit the overflow drain hole (top center). The tote box lid with the center cut out makes a retainer for a sheet plastic mulch cover (not shown). Recycle the soil mix bag, black side up. This prevents weed growth and water evaporation. 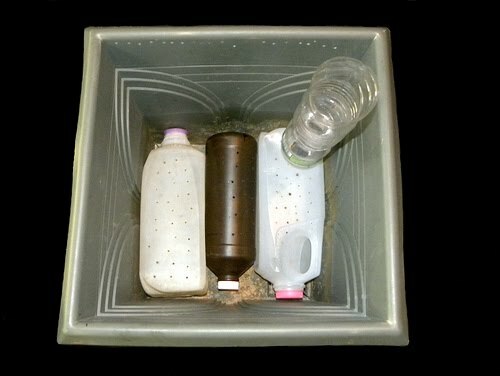 One question about this system is the durability of the milk containers and the inverted nursery trays. How will they stand up through a growing season? The designer, Mr. Hyland, requests that if you do try this design to please send feedback on your results. Once again, his website is Inside Urban Green. 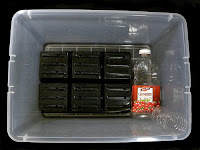 To make the fill tube, simply cut off the bottoms of plastic water or Coke bottles with a box cutter and stack them for any length fill tube.